Symptoms of an evaporator leak are typical of any refrigerant leak, that is, the ice machine runs through all of the cycles normally, however, it just isn't getting cold enough to make ice. Lubricant residue in the bin is a definite leak symptom. Technicians may tell you that you need to replace your compressor and evaporator at the same time. While this may not be bad advice, it will result of a repair bill in excess of $800. If you have access to a brazing torch and good mechanical skills, you can replace the evaporator yourself for about $120. 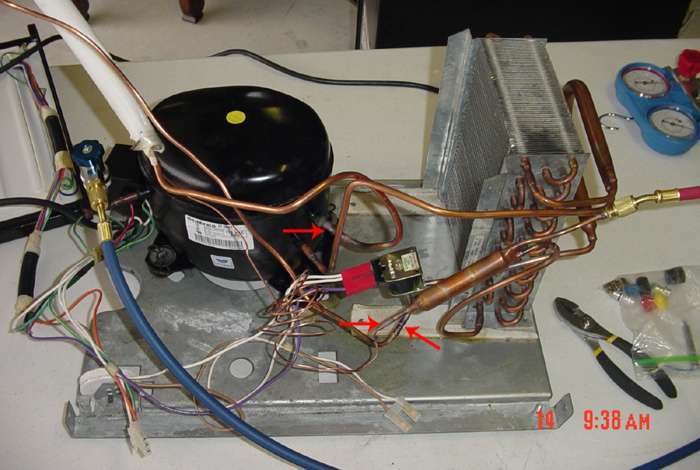 When the evaporator fails, it typically develops a slow leak where its bonded to the freeze plate. It's pretty easy to diagnose using soapy water assuming there's still some refrigerant left in the system. Pull the ice machine out in the open. Remove the cutting grid front cover. Remove the door and the top hinge. Unplug the cutting grid, bin thermistor, and evaporator thermistor. 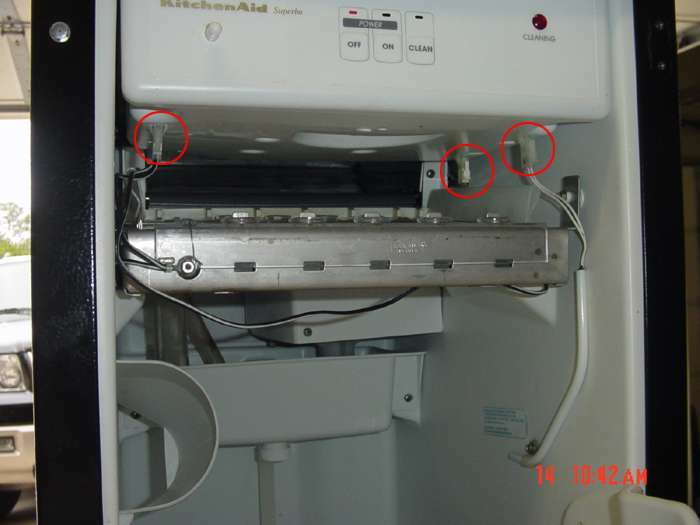 Remove the four screws (two front, two back) holding the top panel of the ice machine. Lift the top panel off. It will still have a wiring harness attached, so you will need to have a chair or something close by to lay it on. See the lines on the freeze plate? That's where the evaporator is bonded to the back. Leaks can develop on them. Spray them with soapy water and look for bubbles. Remove the catch pan from the front of the evaporator. Remove the four screws holding the evaporator. Working on the back - remove the six screw holding wire harness cover. 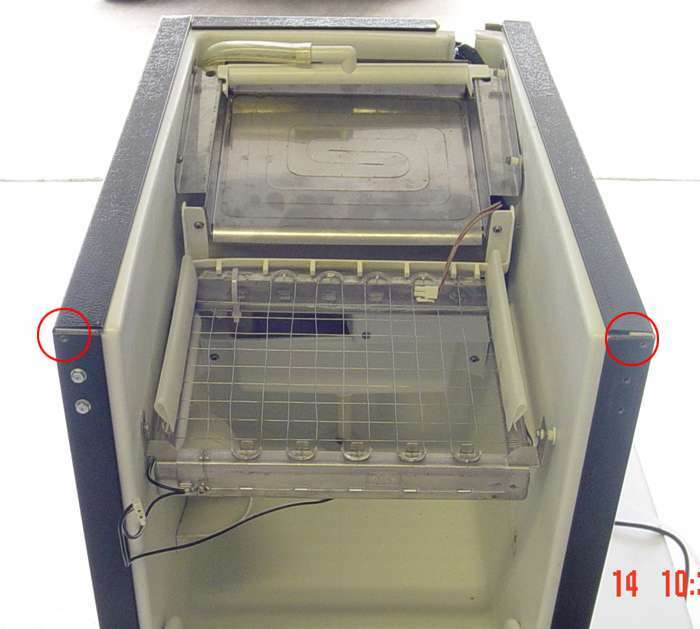 Remove the two screws on the bottom and two more on the front that hold the ice machine bin to the base plate. Unplug the wire harness connectors and lay the top on your work area. There will still be other wires connected to the top, so you'll have to keep the top nearby. At this point you can lift the evaporator out of the bin. The copper tubing is just flexible enough to let you pull it out and back. When your finished, your machine should look like the picture above. Disconnect the clear water tube from the water valve. Lift the entire bin up and away from the base plate. Your machine should look like the one below. Heat the three spots shown with the arrows and remove the tubes. Remove the evaporator. 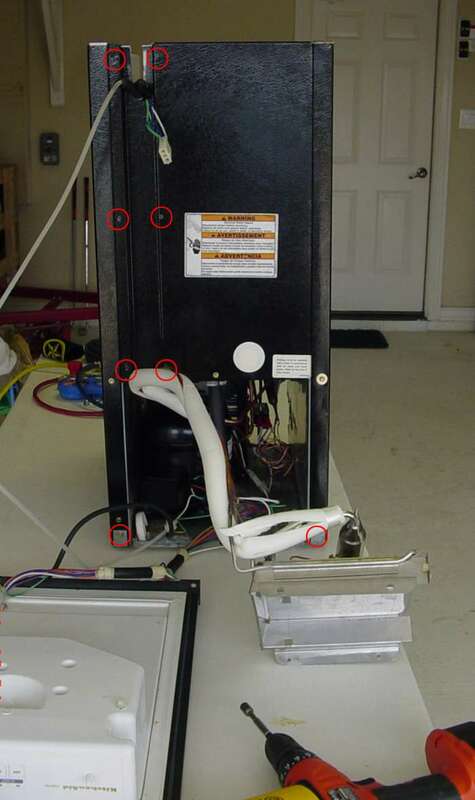 You should install a charging port as part of the evaporator replacement, since the system will only have a pinched-off process tube stub from the factory. I had my compressor replaced while it was under warranty, and the technician added a charging port then. You will probably have to add your own. The low side is on the back of the compressor, the high side is on the drier. A port at either position will suffice. The repair manual states you should charge through the high side, although if you are careful to insert only gas and not liquid, the low side is easier to use. The new evaporator comes with its tubing ends swaged, ready to braze into the old system if you cut the old evaporator out carefully. The thin capillary tube between the drier and evaporator carries the compressed refrigerant to the evaporator. Take care not to clog it with your brazing process. The drier should not need replacement unless it has been exposed to the atmosphere for more than a brief time. I used an inexpensive venturi vacuum gadget from Harbor Freight, as well as their manifold gauge set. Vacuuming and "rinsing" with gas refrigerant a few times via the gauge manifold will remove all condensible gases from the system just as well as a very expensive vacuum pump, at the small cost of a bit of refrigerant. Be sure to plug your bin thermistor back in. The clean light will just flash and the machine won't work if you don't. Weigh in 6.5 oz of refrigerant to the system, or whatever amount the appliance label indicates. If you're not equipped with a proper scale, you can get by with charging half of a 12-ounce automotive can of refrigerant, estimating half of the contents by shaking the can in your hand as it charges. Take care to charge only gas if you're using a low-side charging port, because a slug of liquid entering there could damage the compressor. Have a comment or question about my ice machine repairs?